Turkish President Erdogan Regains Parliamentary Majority in Vote Held Amid Violence & Fear | Democracy Now! In Turkey, the party of President Recep Tayyip Erdogan has regained its parliamentary majority in national elections. On Sunday, Turkish voters elected Erdogan’s Justice and Development Party—the AKP—to 330 of the Parliament’s 550 seats. It’s a major comeback for the AKP after losing its majority in the last campaign five months ago. The victory will help Erdogan strengthen a hold on power critics say has become increasingly authoritarian and divisive. We are joined from Istanbul by Patrick Cockburn, Middle East correspondent for The Independent, who has been reporting on the Turkish elections. 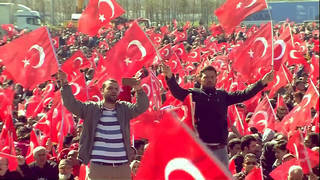 AMY GOODMAN: In a stunning development in Turkey, the Islamist party of President Recep Tayyip Erdogan has regained its parliamentary majority in national elections. On Sunday, Turkish voters elected Erdogan’s Justice and Development Party—the AKP—to the majority of the Parliament seats. It’s a major comeback for the AKP, after losing its majority in the last campaign five months ago. The victory will help Erdogan strengthen a hold on power that critics say has become increasingly authoritarian and divisive, with harsh rhetoric against opponents, a crackdown and raids on the media, and allegations of vote rigging. Turkish voters went to the polls in a climate of violence and fear. Since the June election, Erdogan has resumed the government’s war on the Kurds and escalated strikes on the Islamic State. Turkey also suffered its worst-ever terrorist attack with a bombing that killed over a hundred people at a peace rally in Ankara last month. Despite his victory, Erdogan fell short of the super-majority needed to change the constitution and expand the powers of the presidency. But it’s still a surprising and divisive win for a leader who came under major protest with the Gezi Park demonstrations two years ago. Erdogan’s most vocal opponent, the leftist Kurdish Peoples’ Democratic Party, or HDP, retained its parliamentary bloc by again winning over 10 percent of the vote—but just barely. For more, we’re joined from Istanbul, Turkey, by Patrick Cockburn, the Middle East correspondent for The Independent, who’s been reporting on the elections in Turkey. Welcome to Democracy Now!, Patrick, from Istanbul. Talk about the significance of these elections. PATRICK COCKBURN: Well, this means that President Erdogan is back, with an impressive mandate. His powers seem to be under pressure. But he got 49 percent of the vote. And although there are allegations of vote rigging, I think that this is pretty real. But it’s sort of a consequence, in the eyes of critics, that he won because he whipped up an atmosphere of fear, of crisis, confrontation with the Kurds, you mentioned. We had two devastating ISIS, Islamic State, bombs. And people were fearful, so they clung to the existing authorities. Now, the ruling party, the Justice and Development Party, had pushed the line that they were the only people who could deal with this. The opposition party said, “Yeah, because you’re the guys who provoked this over the last five months.” But if they did so, that’s been pretty successful. So there’s no doubt that this is—you know, this is a tremendous victory for Erdogan. AMY GOODMAN: And what about the repression? What about the repression of the Kurds, using, for example, U.S. support, saying they’re fighting ISIS but going after the Kurds, who are actually allies of the United States? The attack on the media? Can you describe the climate there? PATRICK COCKBURN: Well, you know, it’s sort of edgy. I mean, it’s understandable. There wasn’t in the—during most of the campaign, there were no rallies on the part of the opposition, because a demonstration in Ankara on the 10th of October had been hit by Islamic State suicide bombers that killed 102 people. Earlier, there was another suicide bomb close to the Syrian border in Turkey that killed 32 people. So this made people very nervous. The fighting in southeast Turkey were in Kurdish-majority areas. That had been a sort of shaky ceasefire before this resumed. The Turkish Air Force was attacking the Kurdish guerrillas, the PKK, so-called, both in southeast Turkey and in northern Iraq. And people were watching on television every night the funerals of soldiers and police. So, there’s no doubt that Erdogan was playing the nationalist card and portraying the Kurdish parliamentary opposition as being hand-in-glove with people who were shooting Turkish soldiers and police. So, you have this sort of edgy, fearful atmosphere. But, you know, we’ll now see how long that goes on. Do things escalate? Do they get a bit quieter now? What does Turkey do over the Syrian Kurds having taken over northeast Syria? And now they control half the 550-mile-long frontier with Turkey. Whatever Turkey wanted to happen in Syria, it certainly wasn’t that. And that does it for our show. We have a job opening at Democracy Now! We’re hiring a director of development to lead our fundraising efforts. You can find out more at democracynow.org. Apply immediately.